Nutro Wild Frontier Salmon & Whitefish Dry Kitten Food is a high-protein grain free recipe that's highly nutritious and equally delicious. Made from fresh salmon & whitefish - it's a taste your kitten will love! 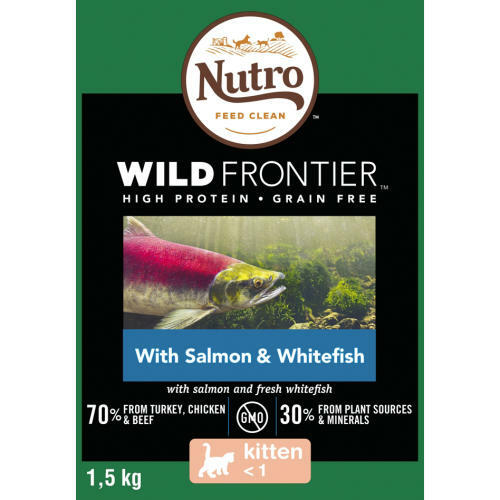 Nutro Wild Frontier Salmon & Whitefish Dry Kitten Food offers a grain free, high protein food for your cat that imitates what their ancestors would have eaten in the wild. Made with 70% animal ingredients from high quality protein sources like salmon, poultry, and beef, your cat will have all the energy they need to play out their wild instincts. We also include fresh whitefish for a taste that your cat will find irresistible. Feed your cat what they instinctively desire.